If there’s one thing this Ginger Book Geek loves to do, it’s discovering a new author and a new series. It wasn’t so very long ago that I had my first introduction to Detective Inspector Tom Mariner. Now it feels as though I have known him for years. Anyway I digress so back to the review I do go. I eagerly download my copy of each new book that Chris releases and I disappear into my reading den. I don’t emerge until I have finished reading. 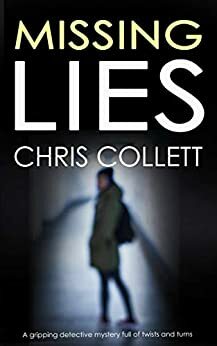 The most recent book in the series is called ‘Missing Lies’ and it was released on 28th October 2018. I absolutely, totally, utterly and completely loved it but more about that in a bit. I have to admit that I have developed something of a soft spot for Detective Inspector Mariner. He is a dedicated police officer and he is most definitely dedicated to his work. He certainly doesn’t have an equal work/ life balance and his dedication to his work has often cost him dearly in his personal life. Mariner is currently single but he has a demanding home life. His late partner’s brother is autistic and following the death of his partner, it emerged that Tom had become his legal guardian. Tom feels ever so slightly out of his depth as he has never been a carer before and he doesn’t have any previous experience of autism. Gradually though he is getting there and he and his sort of brother-in-law are gradually forming a very close relationship and friendship. Mariner can’t help but pine (well sort of) for his old team as some members have gone to pastures new but that doesn’t mean that their friendships have been ended. ‘Missing Lies’ starts with the case of a disappearance of a young woman. Initially Mariner thinks that she has left of her own free will and that the reconstruction of her disappearance is unwarranted. Mariner is under the impression that the reconstruction has only been filmed because of who the woman’s father is. Soon the case becomes so much more serious and worrying details emerge. Will Mariner and his team solve the case before any lives are lost? Will they apprehend the abductor? Well for the answers to those questions and more you are just going to have to read the book for yourselves to find out as I am not going to tell you. As soon as I opened ‘Missing Lies’ and began to read, I felt as though I had reunited with old friends. It didn’t take me long at all to get into the story- actually by the end of the first sentence, I was definitely hooked on this book and reading it became an addiction. I was like an addict in desperate need of her next fix. I couldn’t bear to be parted from the book and I took it everywhere with me. I just had to read on to see how the case progressed and if my hero (Mariner) survived in one piece. The author uses such vivid and powerful descriptions that I really did feel as though I was an invisible member of the investigative team. I even found myself trying to take an active part in the investigation and I would occasionally throw out the odd comment or suggestion, which did attract some strange looks when I was on the bus. Before anybody starts, yes I know it is fiction and therefore not real but I find that if I am convinced by the author’s writing style, the story and the characters I tend to ‘live’ the story. Reading this book was much like being a rather scary and unpredictable rollercoaster ride with twists and turns aplenty. Some of the twists I had worked out but other twists hit me like a punch to the gut. It’s fair to say that I loved, no make that adored reading ‘Missing Lies’. I would definitely recommend this author, her books and this series to other readers. I can’t wait to read what further cases await DI Tom Mariner in the future. The score on the Ginger Book Geek board is an extremely well deserved 5* out of 5*.